BRUSSELS—As the Parliament by-election calls are heating up in the U.K., Prime Minister David Cameron is once again talking about holding a referendum on whether the U.K. should stay in the European Union. That is, if his Conservative party wins a majority next year and he stays prime minister. Calls for separation from the EU are not new in Britain, said Liam Fox, member of the British Parliament and former secretary of defense. “We never joined the concept of ‘ever closer union,’ we are not on the train toward complete reunification with the rest of our European partners,” he said on Tuesday in Brussels. A former empire, located on an island, Britain never felt part of the European continent or the European family of nations, he said. The interests to join and stay in EU were purely pragmatic. 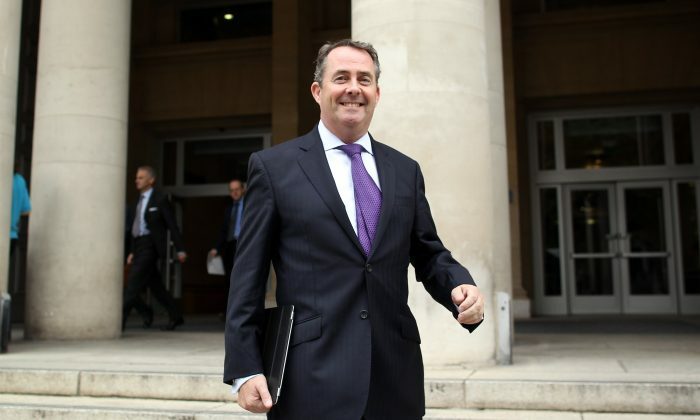 “People in Britain including myself want to cooperate with our European partners, our mutual interest to do so, but we insist on our right to act separately if British national interest requires,” Fox said. Giles Merritt, secretary-general of the Brussels-based think tank Friends of Europe and who is British himself, said that part of being in the EU is making decisions together, for better or for worse. “There is fear [in the U.K.] that Europe is taking decisions that British politicians cannot take anymore. It is not true. The British government is a part of European Union, and they take collective decisions,” he said. The decision for Cameron to hold the referendum is about votes, many believe. Since the U.K. Independence Party won the largest number of votes in the European Parliament election in May, Conservatives sensed that euroskeptic opinions in the country were on the rise and are trying to use the trend for their advantage. “The purpose of Cameron planning for referendum is to retain power, the prime minister wants to be re-elected,” Merritt said. However, this rhetoric may backfire as inside Cameron’s own Conservative party, there is a growing number of Members of Parliament (MP) who are pro-EU, which may divide the party. Merritt says this type of saber rattling is nothing new. Since the U.K. joined the European Union, the relationship was always awkward, but beneficial for both. “Some people in Europe find Britain very irritating, very annoying, but Britain is also very constructive in some areas. On military defense, on foreign policy, finance, banks, insurance, it is more advanced than the continental Europeans,” he added. The demand for reform of the EU from Cameron, however, he said is valid. There are many dissatisfied inside the European Union because of slow growth over the past few years. “There should be better cooperation, doing things together at the same time,” Merritt suggested.